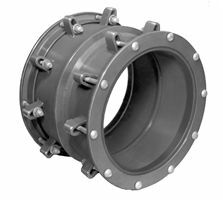 The JCM 203 Steel Transition Coupling provides a simple means of joining plain end pipe of the nominal size but different outside diameter. The couplings are especially useful in joining old cast iron pipe to ductile iron pipe. Listed are the most common sizes. Other sizes are available upon request. For connection of oversize to standard size pipe within the same nominal pipe size. Special ranges available. Available in 2" - 12" OD. Couplings shall consist of one steel middle ring, length and thickness to be specified, two follower flanges, two compounded wedged gaskets and a proper amount of bolts to correctly compress the gaskets into the coupling for the application. Each coupling shall be assembled on the job in a manner to assure a permanent joint under reasonable conditions, shifting and settlement, unavoidable variations in trench gradient and any other unforeseen changes in environment. JCM 200 Series Steel Couplings meet or exceed the ANSI/AWWA C-219 Standard as applicable. JCM 200 Series Steel Couplings are ANSI/NSF Standard 61 and Standard 61 Annex G Certified. Note: Applications in which pipe may move out of the coupling, correct anchorage of the pipe must be provided. In applications for HDPE Pipe, the use of pipe stiffeners is recommended. For additional JCM HDPE product information, see the JCM Fittings and Fabrications for High Density Polyethylene Pipe General Application Information.